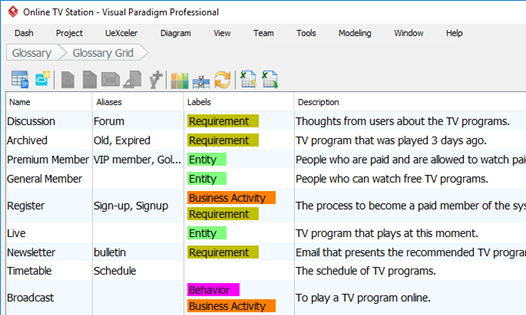 Manage project keywords and phrases in a glossary. So everyone who comes across with those words will comprehend in the same way. Having a standard meaning of domain vocabulary between business users and developers is important. Not merely to achieve efficient communications but also to ensure the system can work according to users' expectation to prevent unpredicted behaviors and unknown terminology used in UI. The Glossary Grid is ready for you to collect and define significant terms in project. 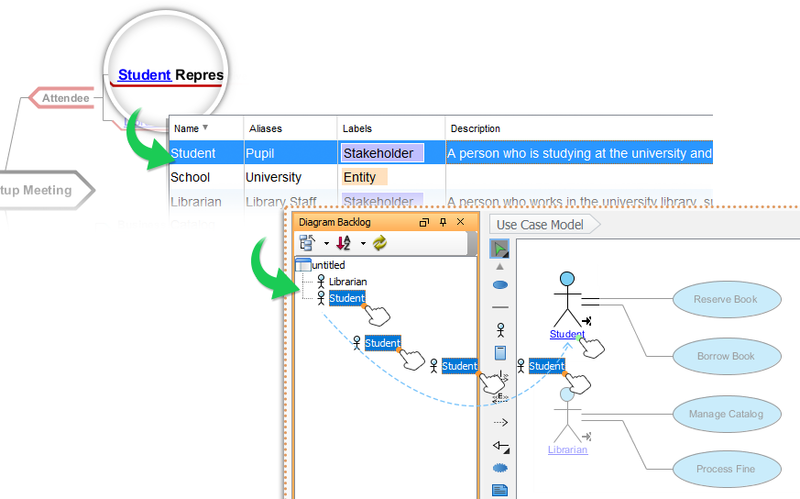 Besides entering domain terms into a glossary manually, you can also extract terms directly from the model. 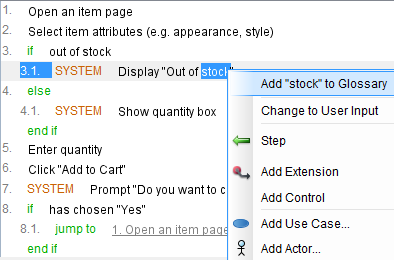 When you read through a description of a shape, simply right click on any key terms to add them into the glossary. You can apply this technique to identify terms from shape names, user story's scenario, the 3'C' of user story (conversation, confirmation, card) and problem statement (in Textual Analysis). The definition of a term is not just about a text description, but also its aliases (i.e. synonyms) and possibly any user-defined properties associated with the term. 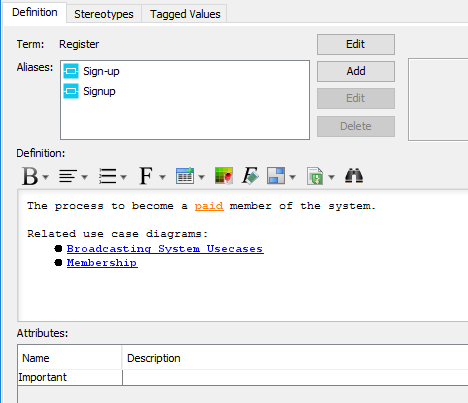 The Glossary feature enables you to define terms in detail by specifying its aliases, tagged values and attributes. Once a glossary grid is established, occurrences of terms in shapes' name and description would be highlighted. You can click on any highlighted term to read their its definition. Different diagrams correspond to different views of a system that could be combined to form a full picture of a system. Any particular element of one diagram may be linked or evolved from an element in another diagram. Visual Paradigm provides a gateway to identify new elements from existing ones and establish the linkages in between. To do this, extract glossary term from the name or description of an element. When you do this, you can optionally create model element with the identified term. 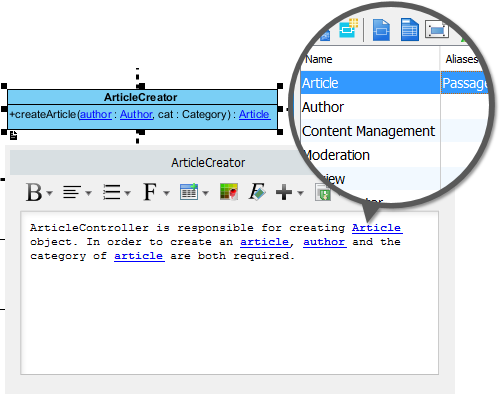 The created element will be put into the Diagram Backlog pane, readily for use in diagram. Output the glossary to Excel as a media for communicating with colleagues or stakeholders. Press Ctrl-Space when naming shape, then choose the desired term from the popup list and that's it.